Knights of Creativity Spirit & Ale: Chili and Beer! Shoudt, of Philadelphia, is ranked No. 5 by the International Federation of Competitive Eating. 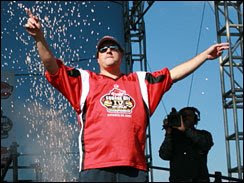 He narrowly beat the federation's top-ranked competitive eater, Joey Chestnut. Chestnut won this year's July 4 hot dog-eating contest at New York's Coney Island with 59 dogs in 10 minutes. 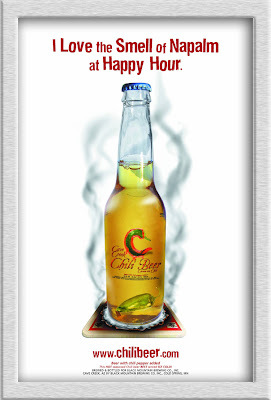 Chili and Beer got me thinking about a beer I had years ago: Chili Beer – beer with a hot chili pepper in it. So, I did what any respectable Knight with too much time on his hands (and fingers) would do, Googled it! "The Arizona desert. Home to 20 million rattlesnakes, Scattered F-16 parts, and lizards the size of beagles. All baked to a crisp 130 degrees. It's the kind of wide open desolation that makes people think twice before shutting off the car. And a place where a cold beer is pretty damned important. 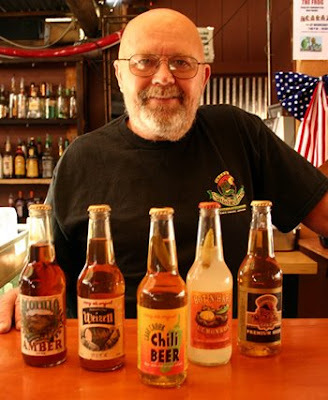 For Crazy Ed Chilleen, of Cave Creek, Arizona, (Pop.1328 including coyotes and cattle) beer was much too important to be trusted to outsiders. So, in 1989, he started brewing his own. The town was suspicious. And became even more so when an entire brewery arrived in crates at the foot of Black Mountain, along with a German named Arnold. But after the first batch the people began to come around. The beer was good, damn good, So good in fact, the yuppies started driving in from all over to try it. Something had to be done, So , whenever one of them whined for a "wedge of lime" Ed started putting a hot serrano chili pepper into the beer instead. Amazingly, about 2 out of ten actually liked the stuff. Surely, thought Ed, the Eighties had come to close. Today Ed with Juan Olguin brew the original "Cave Creek Chili Beer" "Juanderful Wheat" "South of the Border Porter" "Ocotillo Amber" " Frog light" and the original "Black Mountain Gold". Chili Beer is sold in 20 states in the U.S., Japan, China and some other countries with strange sounding names. "WE DRINK ALL WE CAN AND SELL THE REST"
I watched a little of the Democrat and Republican Conventions this week. I heard a lot about "serving our country" and striving to be "great Americans." Unfortunately, they missed telling us the story of "Humble Bob" and "Crazy Ed" and the true American Spirit: Production, Consumption, and having a little FUN along the way. Both Heart Warming Stories Sir Bowie..:) or should that be Heart Burning. Now that's a beer I have to try! I'm also a big fan of Skyline Chili. I stop to get some whenever I pass through Cincinnati on my way to Columbus every month. Words of wisdom about traveling around King's Island. It's a speed trap so watch the dial on your speedometer through that section.